You are here: Home > NB-IoT bins sensors here soon! In Q1 2018 you can have our netBin bin sensors using battery saving NB-IoT networks. As the telecommunication industry catches up with the buzz around internet of things, full scale commercial IoT specific communication is now becoming available around the globe. As an experienced specialist in data communication FarSite have been at the forefront of IoT based communications use cases like Milton Keynes/BT using Neulnet in 2013. 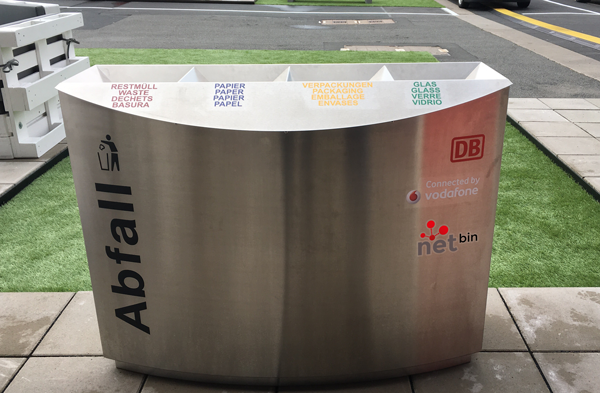 This year we demonstrated netBin using NB-IoT bin sensors at CeBit 2017 in partnership with Vodafone. Our smart waste management bin sensors require a reliable and widely available technology that will perform without issue. FarSite have run multiple tests using LoRa and NB-IoT and have come to the conclusion that NB-IoT will give our customers the best service and this is why. Much shorter duration connections leading to hugely reduced power consumption and significantly longer battery life and more updates per day from the nPods. Excellent signal penetration- Increased reliability of connections in large buildings and below ground operation. Uses existing cellular towers – fast roll out to existing infrastructure across the world. NB-IoT benefit’s from the years spent perfecting coverage for the existing cellular networks. With LoRa generally you need to deploy your own network with all the attendant coverage issues, commercial offerings with good coverage are very thin on the ground. Reduced cellular module costs – NB-IoT bin sensors are already lower cost than 3G and the NB-IoT chips fit onto exiting netBin nPod designs. NB-IoT is here for the long haul future proofing netBin – our nPods are designed to be deployed for many years so need to be ready for the future. When can you get NB-IoT bin sensors? We will be offering NB-IoT sensors from Q1 2018 to those countries that have NB-IoT networks running commercially. The list of countries running NB-IoT is growing every day. If you are interested in using NB-IoT fill level sensors then please register your interest here. Call us on 01256 330461, email us on iot@farsite.com or visit our netBin pages. FarSite is the developer of the smart city focused netBin waste monitoring product suite and has also developed wide variety of data communication products and services for the business sector. These products include Gateways and M2M / IoT products, supplied through a global network of distributors, with products shipped to over 100 countries. The company is based in Basingstoke UK and Guangzhou, China and can boast export sales to a highly prestigious international client list. 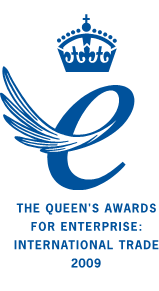 These include some of the world’s leading names in the banking, government, aerospace, military and retail communications sectors. Lloyd Scott, FarSite Communications Ltd.